This dry brine turkey breast recipe is quite fool proof yet simple to do, no basting no covering or gimmicks, no wet brining with special equipment. 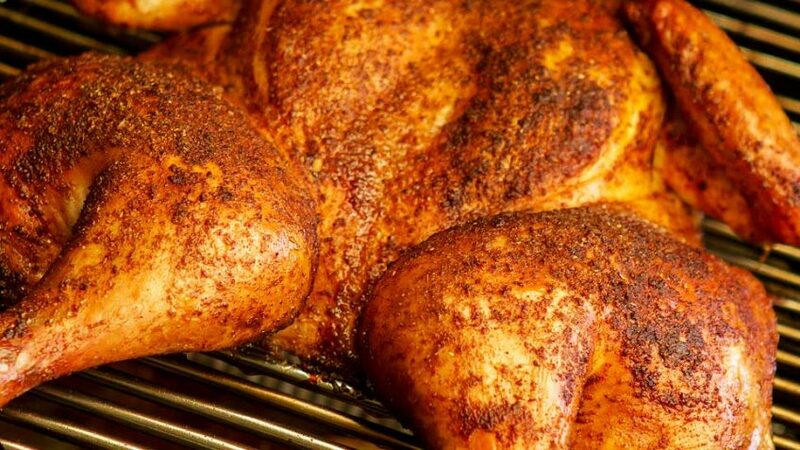 The advantage of roasting the breast only on the bone, is that it doesn’t need as long to cook. Legs and breasts require different cooking times, which is always a hurdle in achieving the perfect turkey. 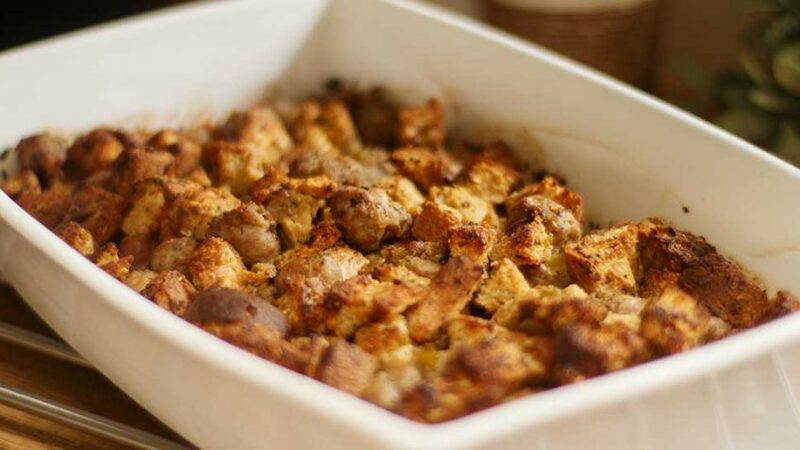 This recipe uses a dry-brine technique which achieves similar results to wet brine by sprinkling kosher salt and letting it sit uncovered in the fridge for 24 hours. The salt draws out the meat juices by a process called osmosis, then the brine is reabsorbed into the meat keeping it moist and also breaking down tough muscle proteins. As the turkey skin hasn’t soaked in brine water, you get a crispier skin and a superior flavoured succulent meat. Enjoy this for Christmas, Thanksgiving or anytime you feel like turkey, as it’s a healthy meat. Note this guide is an approximation guide only, as there are different turkey breeds, ovens and conditions that can affect the cooking times. To be certain always use a probe thermometer. Pierce the thickest part without touching the bone. 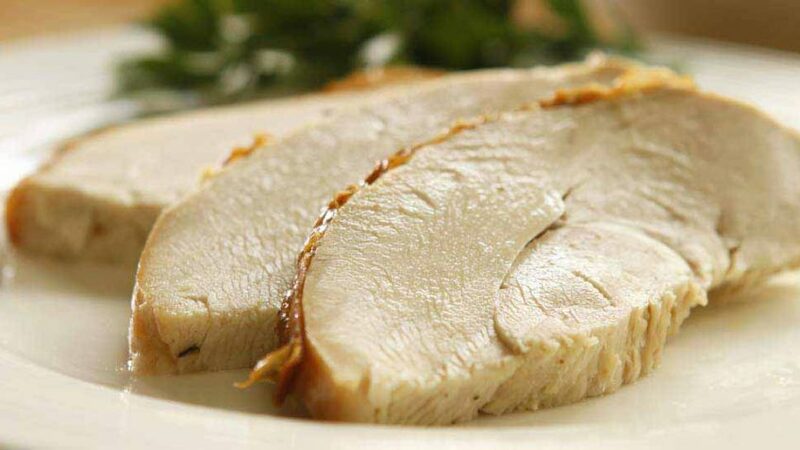 Best meat temperature to remove moist turkey from oven is 155ºF - 68ºC. (Recommended for health reason) is 165ºF - 74ºC but the meat will be a little dryer. Your choice, remember that meat will continue cooking whilst resting outside the oven. This turkey requires no basting, but it's a good idea to rotate the pan every 30 minutes in case your oven has hot spots. Unwrap the turkey from its package if any. Wash under cold water (be careful not to splash raw poultry juices). Pat dry using paper towels. Mix the salt and pepper thoroughly in a small bowl. Add some to the turkey cavity, ensure it touches the breast inside. Then massage the rest into the bird. Gently separate the skin from the breast by running your fingers in between. It can feel like it will tear but it shouldn’t, only the membrane connecting the two should tear. Add the brine mixture under the skin ensuring you have covered the entire surface of each breast. Refrigerate 24 hours uncovered to air dry the skin. Preheat your oven to full temperature. Oil a thick bottomed roasting dish and add cooking oil. Peel and roughly slice the onions, add to roasting dish. Roughly chop celery, add to roasting dish along with roughly chopped carrots. Tear up and add the sage leaves. Strip the leaves of the rosemary, add to roasting dish and mix all ingredients well so they are all coated in oil. Take some of the soft butter using your fingers and ease it between each breast and the skin of the turkey. This process should be easy as you should have already separated the skin from breast for the brine. Ensure the whole breast up to the wishbone has butter under the skin. Massage the outside of the bird with the remaining butter. Place the turkey on the vegetables in the roasting dish. Bake in oven first for 30 minutes at 180ºC – 350ºF . Add the chicken stock pouring it on the vegetables. Return to oven at 160ºC – 320ºF for the remainder of cooking (see guide). Once cooked, remove turkey from tray and set aside to rest for 20- 30 minutes. For the gravy, place the roasting dish with vegetables on the heat and bring it to a simmer. At this point you can add in any turkey trimmings that you may not use for extra flavour. Once simmering, scoop out as much fat as you can from the surface leaving juices behind. Sprinkle the flour into the dish and mix well. 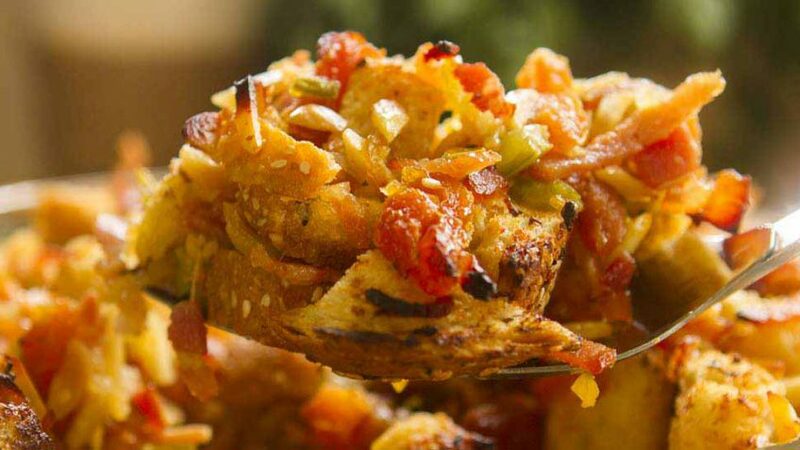 You can also crush all the vegetables for extra flavour. Add the Marsala or red wine. 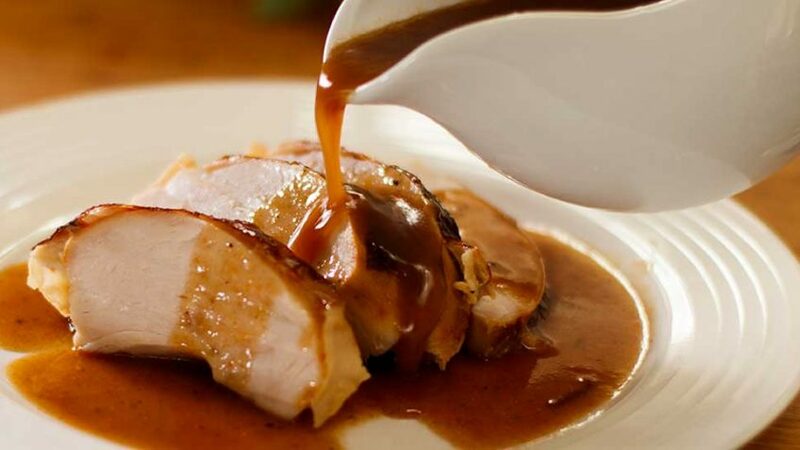 Continue reducing for 15 – 20 minutes, add more water if gravy already appears thick. Continue simmering gently. Once gravy reaches the right consistency, strain in a very fine sieve. 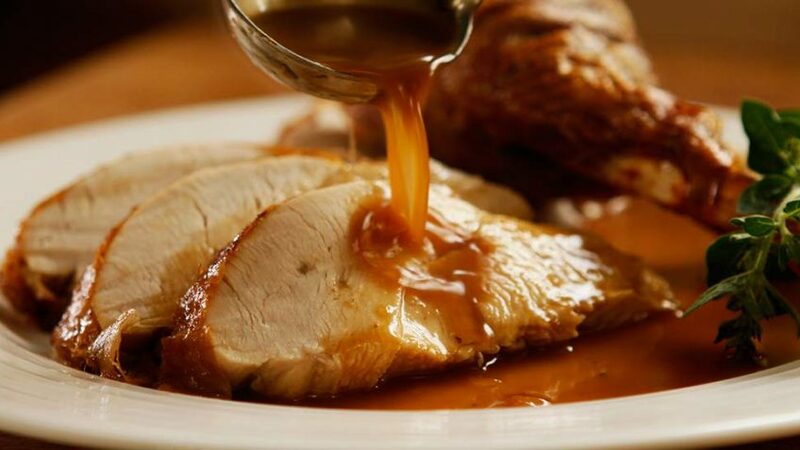 Carve out the whole turkey breast away from the bone, slice evenly on chopping board and serve with gravy. Cooked leftover turkey will keep refrigerated for three days. To test if it's done, make sure the juices run clear when you pierce the breast. If juices appear pinkish, put it back in the oven for another 20 min, then try again. A frozen turkey can take 3 to 4 days to thaw out in your fridge, therefore if buying frozen, buy in advance. Although you don't need to brine your turkey, brining will help keep those breasts even juicier.